How much does it cost to travel to Alice Springs? How much money will you need in Alice Springs? AU$101 ($72) is the average daily price for traveling in Alice Springs. The average price of food for one day is AU$21 ($15). The average price of a hotel for a couple is AU$106 ($76). Additional pricing is in the table below. These average travel prices have been collected from other travelers to help you plan your own travel budget. How expensive is Alice Springs? How much money do I need for Alice Springs? Alice Springs is in the middle of Central Australia and is most famous as a base for exploring the famous rock, Uluru. Alice Springs itself has grown dramatically from what was once a small outpost. The tourist boom began in the early 1980s and the population is now somewhere around 28,000. The city now has all of the necessary facilities to cater to the influx of tourists who swing through to see Uluru. The town is 1500km from Darwin, which is the closest major city. Adelaide is just as far to the south. 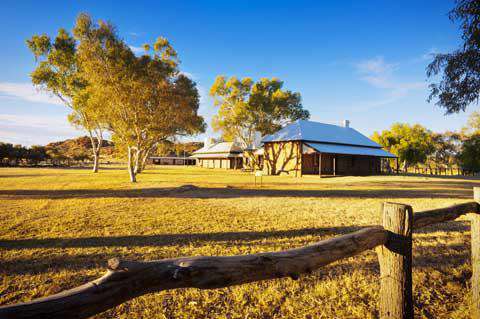 It's remote location means that costs can be higher than they are elsewhere in Australia. Expect to pay more for anything from fruits and vegetables to clothing and souvenirs. When making a reservation for a hotel, do note that the rating scale differs from elsewhere in Australia or in most western countries. The ratings come from the amenities available and have little to do with the actual room quality. Alice Springs has a desert climate with highly variable weather from year to year. In particular, yearly rainfall can differ dramatically from one year to the next. Summer temperatures in Alice Springs can reach into the mid 40s Celsius with winter temperatures dropping to 6 degrees Celsius. There are about 12 freezing nights a year. In addition to having Uluru, the surrounding landscape around Alice Springs is quite fascinating. It is made up of gorges and desert features that are striking in color, particularly at sunrise and sunset. There are also Aboriginal communities that have a fascinating and very informative history that they are eager to share. Visitors should also consider heading to Kata Tjuta and Kings Canyon in addition to the famed Uluru. Other places worth visiting include the Alice Springs Desert Park, the Reptile Centre, and the Olive Pink Botanical Garden. Historic sights in the area include the Adelaide House, the Old Timer's Museum, the Residency, the National Pioneer Womens Hall of Fame, the Alice Springs Telegraph Station, and the Alice Springs Cemetery. Alice Springs is very near the center of the continent. It's about 1200 kilometers from the nearest ocean and 1500 kilometers from the nearest cities of Darwin and Adelaide. It's also the midway point for the Adelaide-Darwin Railway. The McDonnell Ranges are to the south. The roads in the area are quite flat and usually go around, instead of over the hills, in part to respect the sacred sites of the local Indigenous people. There are a decent number of adventure activities that you can enjoy in and around Alice Springs. Balloon Rides are popular at sunrise. Bicycle or motorcycle tours are also available. Pyndan Camel Tracks is a unique one hour or half day camel tour of the area. If you're itching to get in a round of golf, there's also a golf course in the area, complete with a clubhouse which offers drinks and snacks. As a growing tourist destination, Alice Springs offers a decent supply of restaurants and cafes. There are a few good sit down restaurants including a Thai restaurant and an excellent grill, Red Ochre Grill, which uses many indigenous ingredients. Other options include a steakhouse, Indian food, pizza, and pasta. If you just want to grab a drink, head to Town and Country, which is a pub that has a great atmosphere and some light meals. There are also several fast food options available. McDonald's, KFC, Burger King, and Red Rooster are the main chains available, and several other less popular options as well. You can also pick up some food at Ling's Supermarket. They have Asian food such as noodles, rice, kim chi, and several frozen meals. You can reach Alice Springs by plane, train, bus, or private car. Obviously the easiest way to travel to Alice Springs is by plane. There are flights in to Alice Springs from many major cities, but do note that Uluru actually has its own airport. If you're making a quick trip simply to see the rock, do not bother passing through Alice Springs. Train tickets are actually more expensive than flights. The Ghan is the private tourist train that makes the trip from Adelaide and is quite an enjoyable experience, although not cheap. It does continue on to Darwin. If you're planning to drive, you can expect a 17 hour trip from Darwin and an 18 hour trip from Adelaide. Coming from Adelaide, the Stuart Highway is in good condition and will pass through several towns including Coober Pedy.